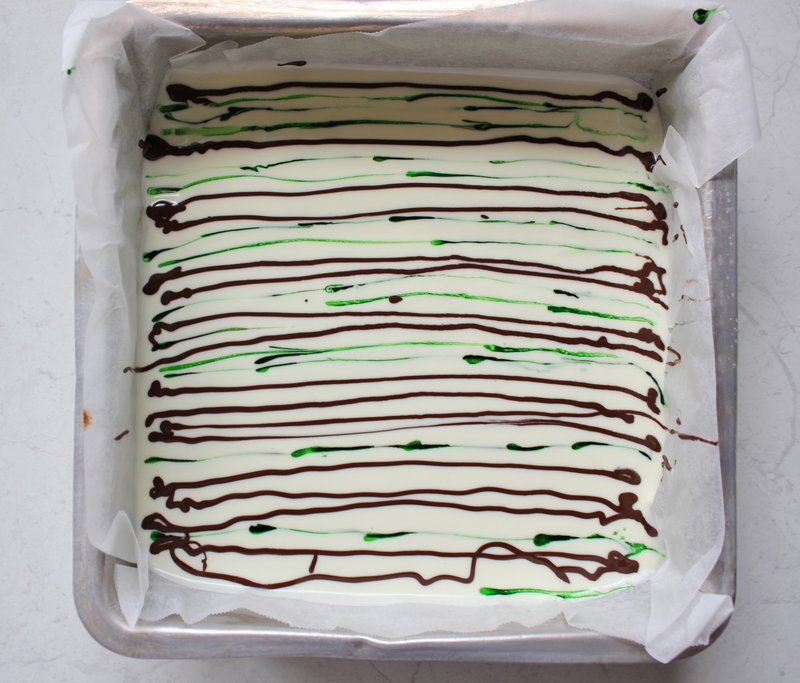 Yesterday I posted a delectable little cake in preparation for St Patrick’s day – it was chocolatey, Guinness-y and whiskey-y. Delightful. 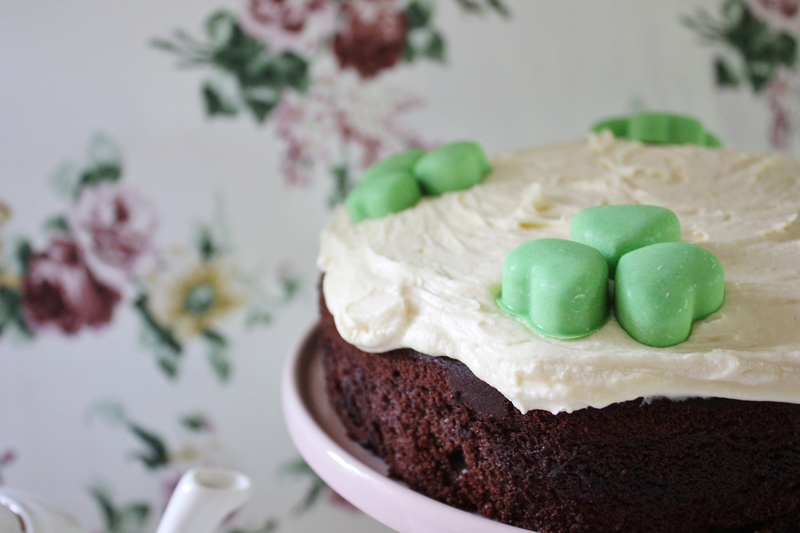 What I held off posting, was a little recipe for the chocolate clovers I decorated the cake with. This Friday I’m having a bit of a “take it easy” post, so I’ll give you two cake chocolate decorations to jazz up your cake. These two are appropriate for Irish themed cakes, but can be tweaked to suit any cake your little heart desires. 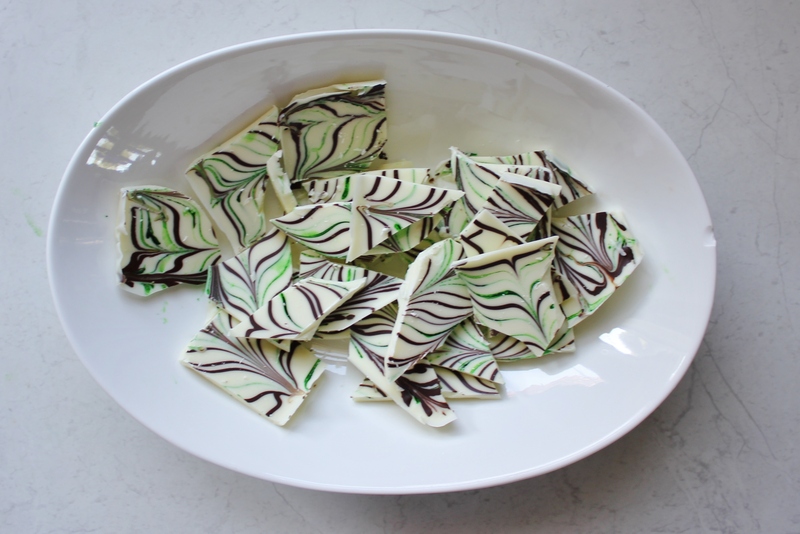 Chop up your white chocolate and zap it in the microwave for about a minute. Give it a stir and return to the microwave until the chocolate is JUST melted – you don’t want to overcook it because your chocolate will seize. 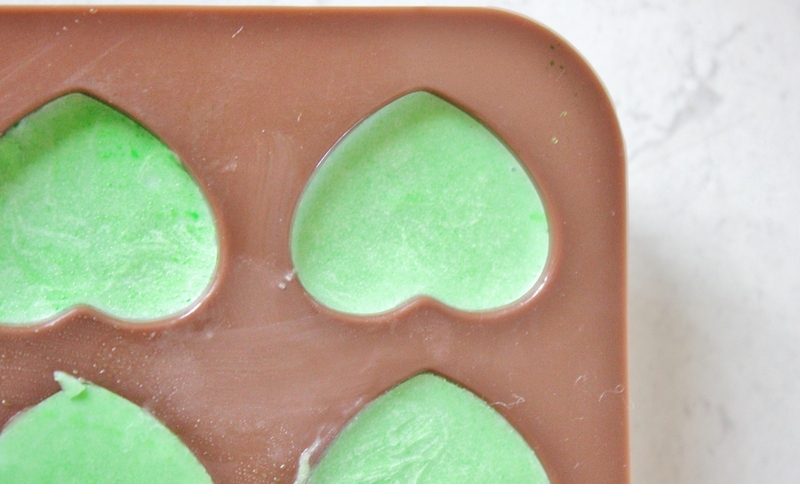 Take the warm chocolate and add your food colouring slowly until you achieve your desired green-ness. Spoon the mixture into the moulds and refrigerate for 20 minutes. Remove from the fridge and test whether they’re done by pulling the sides of the mould away from the chocolate to see if the chocolate is set yet – if the chocolate stays in one piece, it’s done. Arrange in groups of three to mimic the formation of a clover. 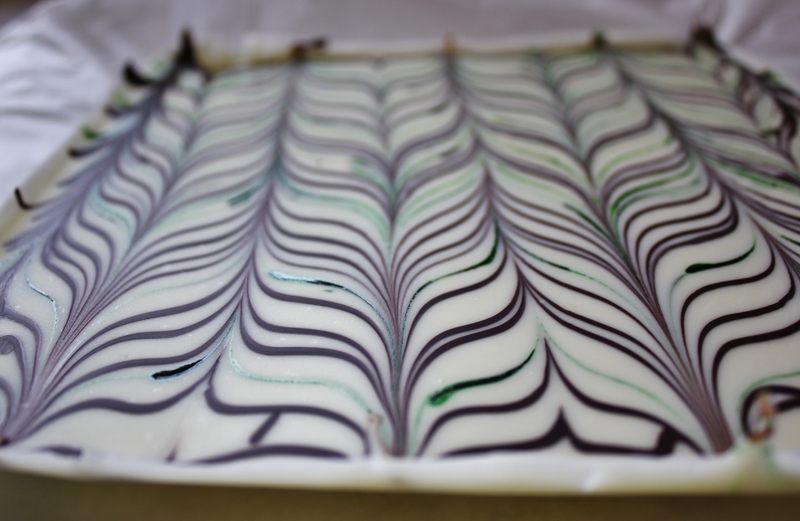 Lightly grease and line a 20cm square tin. Chop up your white chocolate and pop it in the microwave for about a minute, then give it a stir. Return to the microwave until the chocolate is JUST melted. Pour into your prepared pan and set to one side. Don’t allow it to set. Working quickly, melt your dark chocolate and spoon it into a snaplock bag. 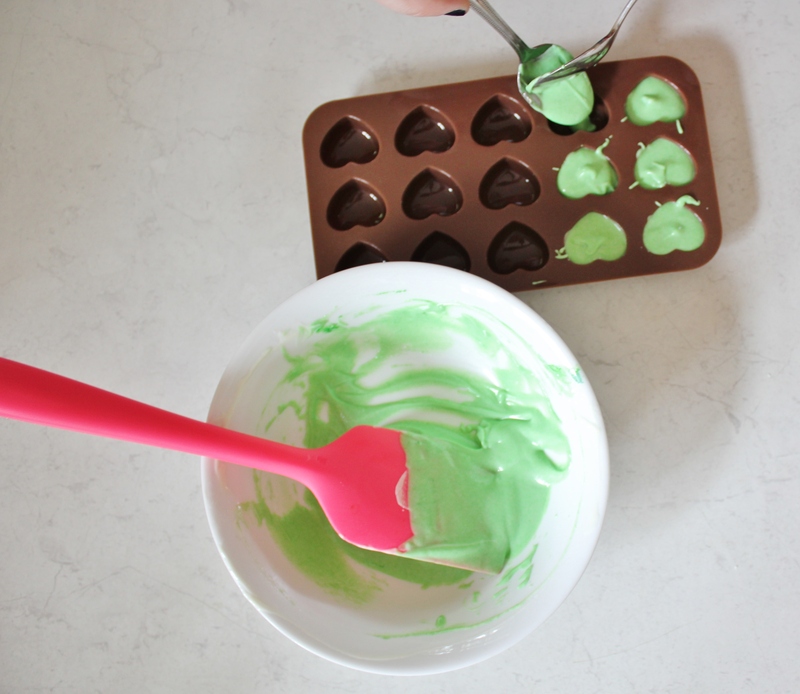 Pour your green food colouring into a small dish or egg cup and grab a bamboo skewer. Use the thin edge of the skewer to draw a number of lines across the surface of the still warm white chocolate. You may need to clean the skewer as you work. Snip the end off of the snaplock bag and draw some lines of chocolate across the white chocolate as well. Don’t worry if your lines aren’t completely straight – mine were pretty wonky, and they turned out fine. Flip the skewer around, and use the thicker end of the skewer to draw more lines in the white chocolate. When you’ve finished, you should end up with a collection of lines running parallel to one another with thin gaps of white in between them – try not to let any lines intersect. 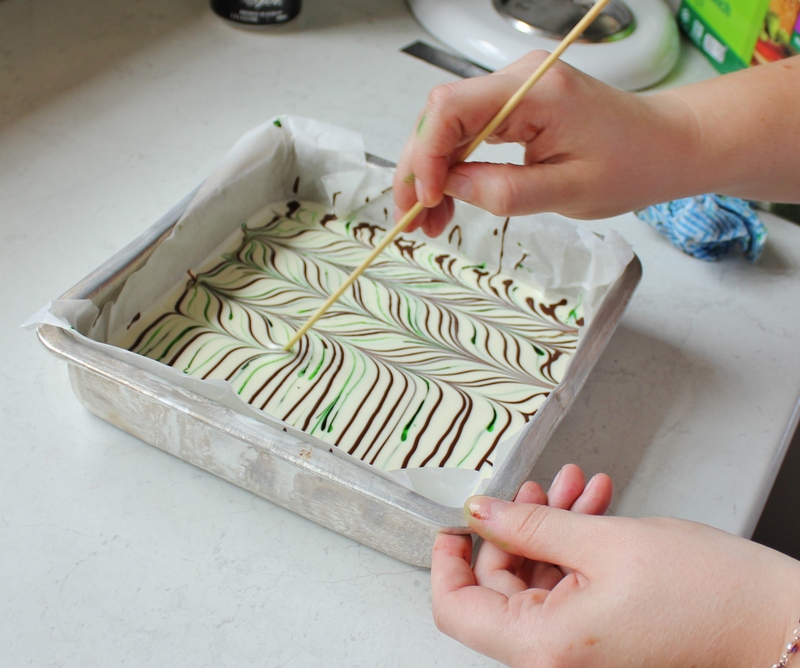 Flip the green-edged skewer to the thin side again and drag it up and down, through the lines to create chevrons. Again, you may need to clean the skewer as you go to maintain clean lines. Pop in the fridge for 20 minutes or until set. 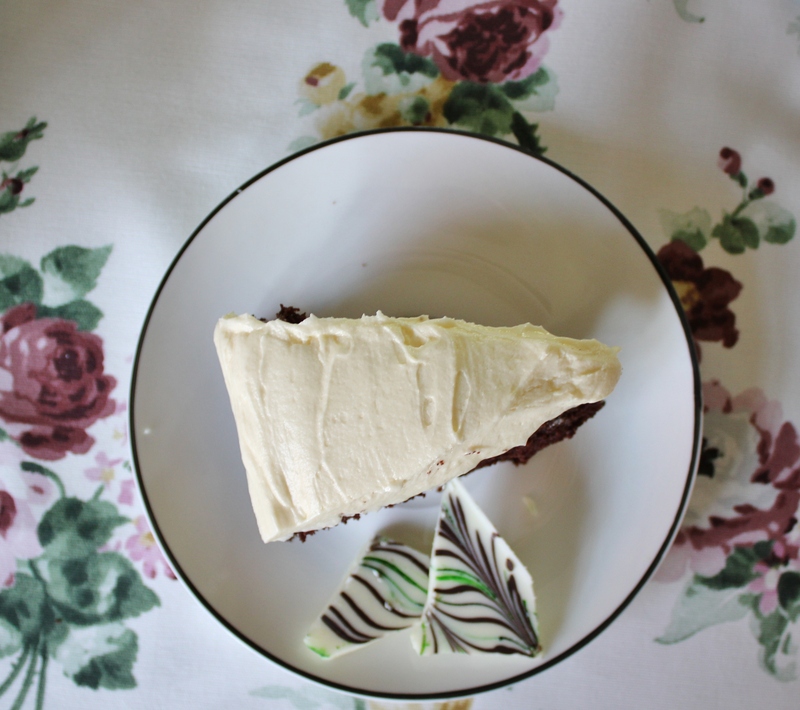 When it’s set, chop roughly and serve atop your cake, or set on the side of the dish. 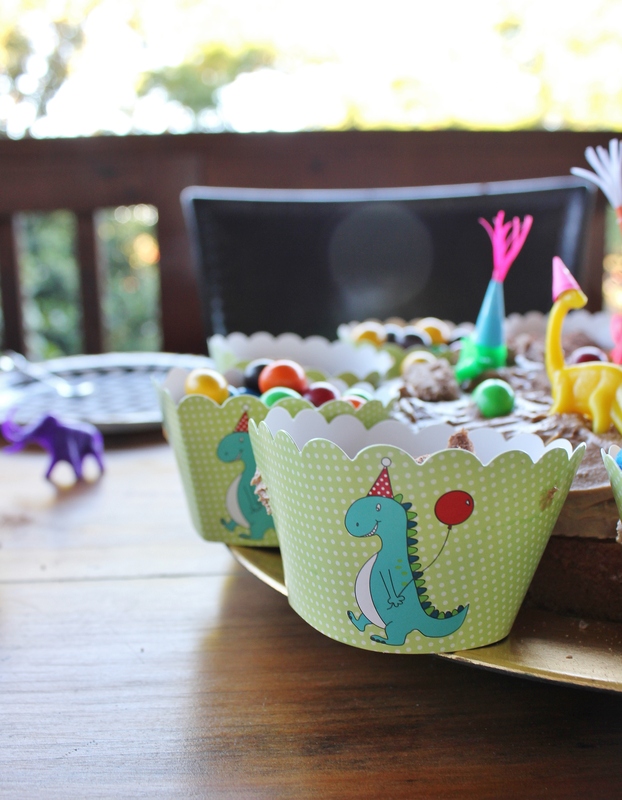 There you go – two easy chocolate decorations to jazz up your cake!